Can you believe Thanksgiving is next week?? Last week we told you about all of our Easy Thanksgiving Day Recipes so we thought you could use some delicious side dishes next. It looks like we will be hosting Thanksgiving at our house this year and my husband and I are in charge of all of the side dishes. Oh yes, the hubs will be cooking too! We have already given you are best Thanksgiving day desserts with our famous Homemade Pumpkin Pie recipe. 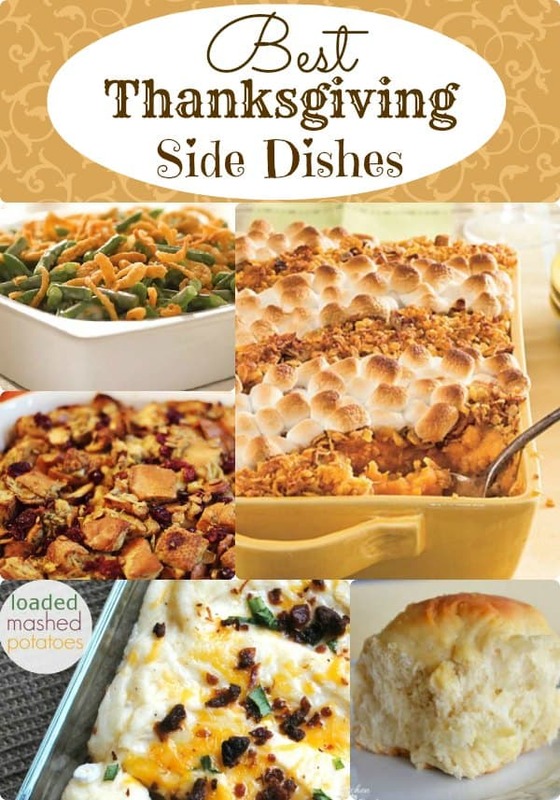 So whether you are in charge of one side dish or all of them, here is a list of some of the Best Thanksgiving Side Dishes I have come across. 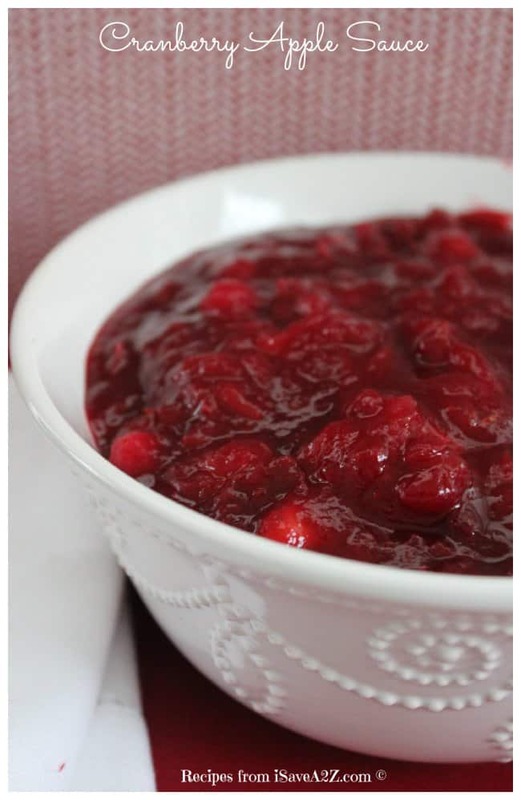 One top recipe for a Thanksgiving side dish is this sweet and savory Easy Cranberry Applesauce recipe! I don’t even care for cranberries by themselves but I absolutely love this recipe. It’s topped our list and it’s a must try for everyone!!! It can be served warm with pork or turkey or you can serve it cold as a dessert and pour it over a scoop of vanilla ice cream. Yeah, it’s that good! Sweet Potato Casserole is my absolute favorite side dish at Thanksgiving! Why do we not make this year round?? People make it several different ways, but mine has to have pecans and toasted marshmallows on top. I also prefer to use chunks of sweet potatoes or yams instead of mashing them all the way. Stuffing is just one of those things that you must have at your Thanksgiving meal. 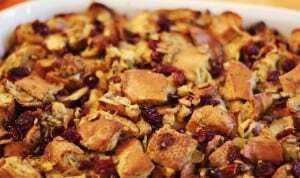 But have you ever tried Cranberry Apple Stuffing? I haven’t, but this looks amazing! I actually didn’t even like stuffing, for some odd reason, until a few years ago. The idea of adding cranberries and apples really makes my mouth water. As an added bonus, I bet it makes your house smell wonderful too! Is it normal to fight over dinner rolls at a family gathering, or is that just my family? Can you ever have enough of these buttery pieces of love at the table? 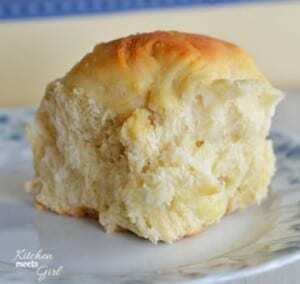 Here is a copycat recipe for Hawaiian Rolls! My mother-in-law will be in heaven if these turn out as good as they look. Of course I can’t leave mashed potatoes off the list. I will give you fair warning, these are called Jill’s Cheating Potatoes because they are actually dressed up instant potatoes. GASP!! I know, I know some people think it’s Thanksgiving and EVERYTHING should be made from scratch. But I’m only one person (with a lot of family)!!! Besides…..can you really go wrong with bacon, cheese, butter and sour cream? Okay, this is where my husband comes in. Every year he gets the task of making the Green Bean Casserole. If I’m being totally honest, I’m not fond of green beans…even if they are covered in mushroom soup! This is a classic recipe and is very easy to make. The one change that my husband does is use french style green beans instead of the cut green beans. 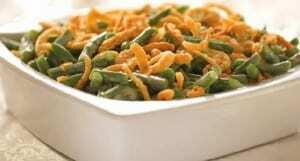 Everyone says it is the best Green Bean Casserole they have ever had! Well, these Best Thanksgiving Side Dishes should get you well on your way and maybe even gave you a couple of new ideas. I’m excited to try the copycat Hawaiian Rolls and very tempted to see if I can get away with boxed potatoes. Be sure to check out our list of Easy Thanksgiving Recipes and our Favorite Thanksgiving Dessert Recipes too! Enjoy your holidays! By Jennifer on November 5, 2016 Recipes, Side Dishes, Thanksgiving Day, Trending Topics. I second Suzanne and Mindi’s love for the sweet potatoes with marshmallows. 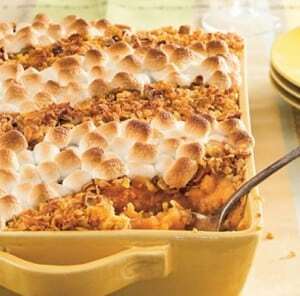 Love the sweet potatoes with marshmallows, my grandmother used to make them that way.